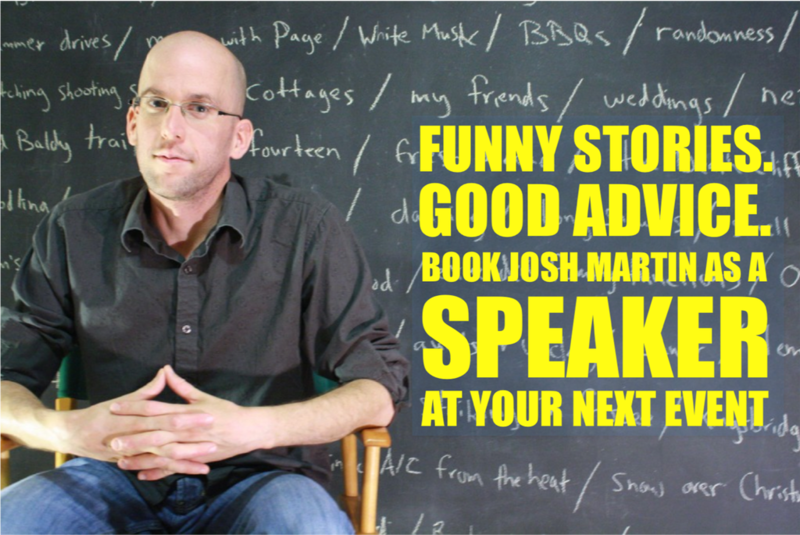 Josh Martin’s talks combine humorous storytelling with practical and motivational advice, and can be catered to any audience. From banquet halls and boardrooms to classrooms and community centres, we’ve presented to audiences young and old, big and small. So whether you’re kicking off a charitable campaign or event, celebrating your volunteers or looking to energize your employees or students to realize their potential, get in touch and let’s chat. Lifestyle Citizens is a federally registered Canadian not-for-profit located in Waterloo, Ontario. As such, we deliver a lot of our talks and workshops to groups in Kitchener-Waterloo, Guelph, Cambridge, Toronto, London, Hamilton and surrounding areas. That said, we’re certainly not opposed to traveling farther afield and try to be as accommodating as we can. Bottom line: get in touch and let’s see what’s possible! How much do the talks cost? It really depends. While some groups have money for honorariums, we know that others won’t. To help cover our expenses so we can keep the price of our talks low or free, we actively reach out to community partners who pitch in with donations. So whether you’ve got a budget line slated for speaker fees or a near-empty Tim Hortons gift card to offer, contact us and let’s chat. How long are your talks? How long do you need them to be? Our talks can be catered to a variety of lengths, from 15-minute presentations to hour-long sessions to half-day workshops. We use humorous and inspirational stories to talk about practical ways we can cultivate the attitudes and behaviours that make life and world around us better. Our presentations cover topics like overcoming obstacles, how our everyday actions can have a big impact and learning to appreciate the little things in life. One of the nice things about these presentations is that they are very customizable. Holding a volunteer appreciation event? We can adapt our material to discuss the value of giving back. Kicking off Earth Week activities? We’ll focus our message on the little things we can do to help the environment. Launching a new United Way campaign? We’ll talk about the power of community and being good neighbours. We’re happy to cater to your specific needs. Although Lifestyle Citizens was officially founded in 2013, Josh Martin has been sharing his story and delivering talks since 2011. He served as a member of Canadian Blood Services’ Speakers Bureau and did a cross-country speaking tour in 2014. Over the years, he has presented to big school assemblies and corporate events, as well as more intimate gatherings with youth groups and small businesses.